North Korean leader Kim Jong-un has launched an unusual barrage of criticism at officials over delays in completing economic projects. The country’s leaders usually praise officials during factory visits. But this time state media said he was “speechless” a power plant was only 70% complete and “appalled” at hot spring bathtubs “dirtier than fish tanks”. Pyongyang has long pushed for economic progress as the second tier alongside developing nuclear arms. The visit and Mr Kim’s harsh comments were covered by state-run media, with the country’s domestic newspaper Rodong Sinmun devoting a whole nine pages to the story. 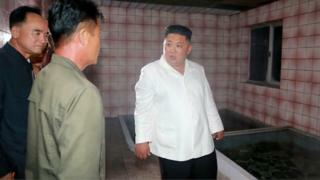 The comments were also translated into English and released on the main foreign-facing news agency, KCNA. “The very fact that Rodong Sinmun reports about the supreme leader criticising someone is notable, as normally such things are not done in open press, which, in the overwhelming majority of cases, maintains the image of the DPRK as a perfect country,” analyst Fyodor Tertitskiy of NK News told the BBC. Is the North sticking with its nukes? What we appear to be seeing is a leader eager to project the image of an economic reformer both at home and abroad. Kim Jong-un made a promise to his people when he took power in 2011. He told them living standards would improve and that he would implement reforms to build the economy alongside making his country a nuclear power. Now that he’s declared the nuclear programme complete, he is trying to show North Koreans that he’s making good on his economic pledge. He is also shifting any blame for the failure to complete the projects onto local party officials, rather than his leadership. He appears keen for foreign media to see this too. North Korea has been trying to brush away suggestions that it has no intention to denuclearise. There has been very little progress on disarmament since Mr Kim met Donald Trump in Singapore. This latest very colourful and public incident allows Mr Kim to argue that his focus is very much on the economy – not on building nuclear weapons. While it is not uncommon for Mr Kim to be shown giving “on-the-spot guidance” to attentive officials, the explicit criticism of specific committees is unusual. During a visit to a power station which is only 70% complete, Mr Kim said he was “so appalled as to be left speechless”, according to KCNA. “He reprimanded the leading officials of the Cabinet for leaving the project to the province only and not paying attention to it,” the agency said. He also criticised the dirty condition of hot spring bathtubs at a holiday camp, describing them as being “worse than fish tanks”.